I vividly recall when it looked like Talking Heads were a spent force by 1980. Their third album with Brian Eno had pushed the band to the near breaking point while making exceptionally compelling albums. In 1981, all of the band splintered, KISS-like, into “solo” concerns and released their own albums. Jerry Harrison had a solo album, with many Expanding Heads sidemen/women on it. Tina Weymouth + Chris Frantz formed the hit Tom Tom Club. And David Byrne scored a Twyla Tharp ballet. As ever, he staked out the “high end.” Adrian Belew and Steve Scales played on all three projects! While I had the Harrison and Tom Tom Club albums from the get-go, I balked on the Byrne project. Simply due to the fact that the LP had 40+ minutes of excerpts from the score, but the cassette had the full 73 minute score. I hated buying cassettes [their quality was low], nor did I want to buy an edited selection, so I didn’t buy anything! In 1990 the CD revolution gave us the complete score on a compact disc. <Flash Forward 28 years> I have now bought a copy of this soundtrack on the preferred format, and I am crestfallen that I did not act much, much sooner. There were six vocal songs here and the rest of it was instrumental material but wait…! There were several tracks with “found vocals” exactly like Byrne/Eno had made on their impressive “My Life In The Bush Of Ghosts” sessions of “R+D” for the fourth TVLKINGHEVDS album, “Remain In Light.” So this album walks a line connecting that album to late period TVLKINGHEVDS. This is from the time when Eno + Byrne were very Afrocentric in their tastes with Fela Kuti influenced afrobeat music given a neurotic white spin for maximum Brechtian distancing effect. The album began with a bang! “His Wife Refused” could have been a track on “Remain In Light.” The band comprised famed drummer Yogi [Kid Creole + The Coconuts] Horton on drums with Bernie [P-Funk, Expanded Heads] Worrell on keys and Adrian Belew on “steel drum guitar” and let me tell you, yes, it sounds exactly like that! “Adé” was undoubtedly a tribute to King Sunny Adé and Eno himself [he appeared on five of the tracks here] played the walking bass line! “The Red House” seemed for all the world like a lost track from “My Life In The Bush Of Ghosts.” The sampled, dubbed out ethnic vocal snatches were straight from that album’s playbook. As was “Eggs In A Briar Patch,” with an anonymous evangelist preachifying over the anxiety-ridden music. “Cloud Chamber,” redolent with kitchen metals percussion, sounded like outtakes from the earlier album’s “Mountain Of Needles.” There was a lot of very familiar territory covered here. At the same time, a track like “The Blue Flame” was obviously burned into the cortex of Barry Andrews, who derived much of Shriekback’s DNA from it. If you don’t believe me, just try “Coelacanth” from “Oil + Gold” on for size! So echoes of this album carried forward in mysterious ways. Many of the songs here would slot comfortably into the headspace that that also generated ‘Remain In Light.” All of the instrumentals, whether under a minute or almost four minutes long, were fascinating, intriguing works that were in their own way, as compelling as the songs. The whole score was segued together with no dead air between tracks. The vocal tracks were similar in feel, though the relatively few personnel on this album in comparison meant that the density of the music was somewhat lighter. These songs had about 3-4 musicians other than Byrne on them, at most – unlike the 9-piece TVLKINGHEVDS that preceded them. But the African grooves were still front and center with perhaps less dense polyrhythms driving them in a similar fashion in any case. 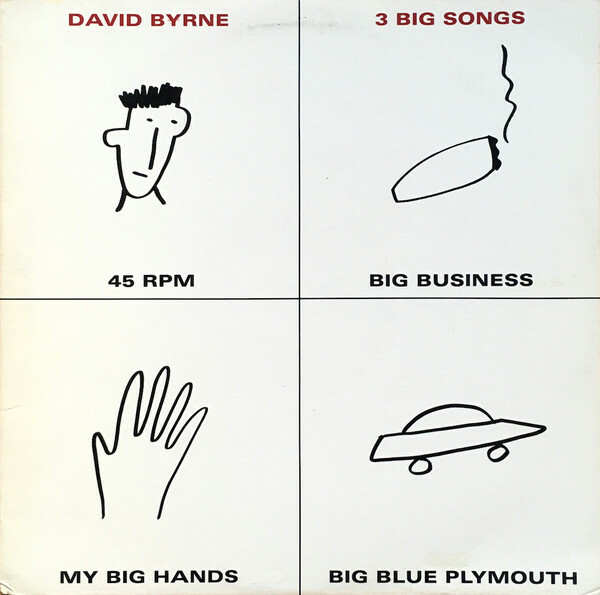 The three songs with “big” in the titles got their own North American EP. “Big Business” and especially “Big Blue Plymouth [Eyes Wide Open]” were as good as anything on “Remain In Light” so that means that they were pretty astounding, webs of polyrhythmic sound given provocative, cliché free lyrics courtesy of Byrne. And his anxious, extremely neurotic and white persona invested these paradoxical songs with thick frissons of cognitive dissonant funk. In short, like all of the other TVLKINGHEVDS 1981 solo albums, this one is amazing! The Jerry Harrison and Tom Tom Club albums share with this a final burst of inventiveness that would be given the heave ho from TVLKINGHEVDS once the re-grouped in 1983 for another four, increasingly pedestrian, studio albums. If anyone is a fan of “Remain In Light” and “My Life In The Bush Of Ghosts,” then you must buy a copy of this album immediately! It effortlessly channels the brilliant energies that made those albums possible for one last time with Byrne at the helm. Non of the condescending Americana or fake salsa Byrne released came within spitting distance of the artistry on view here. This entry was posted in 30 Days - 30 Albums and tagged 1981, 1990, David Byrne, Talking Heads. Bookmark the permalink. 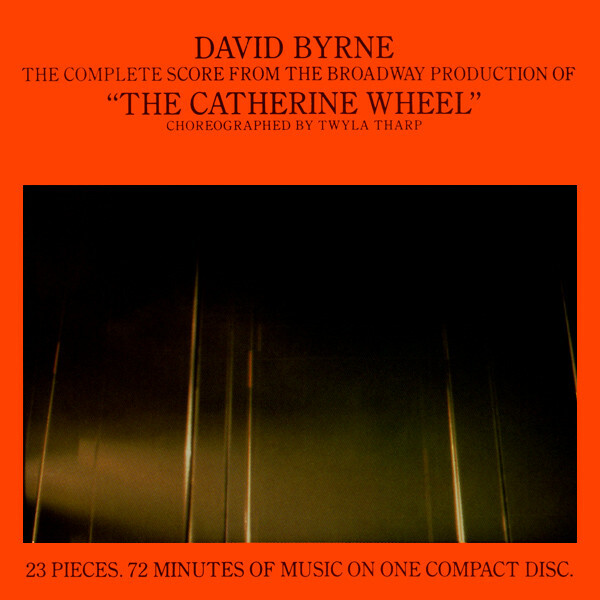 The Catherine Wheel is quite an important album in my collection. I will go as far as to say that is much more immediate and memorable for me than My Life In The Bush Of Ghosts. Part of this is that I see a distinct line that runs from Fear Of Music, through The Catherine Wheel and to Remain In Light. MLITBOG stands a bit more disconnected from Byrne’s work in the past, while of course having much in common with Remain In Light. The Catherine Wheel’s place is much stronger in the TH Canon for me because of how I perceive this linkage. I agree with your assessment that there are songs that, if Remain In Light had been a more expansive affair, would have slotted in easily. The thought of adding Chris and Tina to My Big Hands makes me a bit giddy really. Adding Jerry Harrison’s guitar to Big Blue Cadillac is a no brainer – in fact I can’t help but think it’s a song Byrne was hanging on to for a while…it feels very More Songs About Buildings And Food to these ears. Finally it is certainly one of the albums that pulls the curtain closed on the Talking Heads that I love. And this was a very big deal to me 35-37 years ago – it still is. With Speaking In Tongues, the band made the move, for me, rather radically from deep left field to shallow center field. As a fan, we grew apart. 1981 saw me finish High School and begin my University journey. I didn’t bring anythin new from Talking Heads along with me. They were a product of a particular period of my youth that was best left behind – their importance, has still not diminished, for me, because of their work from that time. Shame, The Red and the Black is horribly expensive on cd, does anyone have the first Casual Gods album, any good? SimonH – I managed to to get the JPN CD for about $20-30 about 20 years ago. I’d pay up to $80 for it if I had to. It is on iTunes – CHEAP! [$5.99] I have all of the Casual Gods albums. They are all worthwhile to an extent, but nothing on “The Red + The Black.” Each one was weaker than the last but even the last was good enough. Like the Bauhaus career arc. I just checked Discogs.com for the going price and saw that there was also a German CD?! Who knew? Thanks! Shame, I doubt a cd reissue is likely. Will keep an eye on the prices. May pick up the first Casual Gods cd, nice and cheap thankfully. I have the Catherine Wheel cd on order as we speak. SimonH – You won’t regret that! “Catherine Wheel” should have been in my Record Cell from day one. I had the cassette version of this title back in the day, but I ultimately decided that the vinyl LP was my preferred configuration, being as it was more concise, excising some instrumental fare that i found a bit ponderous. Always loved the songs, particularly “His Wife Refused”. I shall have to revisit this; haven’t heard it for yonks. Big Mark – For the record, I found none of this ponderous. I felt that the instrumentals added a lot of variety and breadth to this project. Beside’s, it’s a ballet score! “His Wife Refused” was the best song Byrne ever wrote after 1980. You’ve reminded me that I actually own a copy of the “Three Big Songs” EP and have never played it! Happily, I can access the complete score instantly via Apple Music. I have most definitely heard “His Wife Refused” before, and IIRC that’s because I likely played it myself on WPRK as a random track on one of my shows — and again IIRC it was followed by “Sharkey’s Day,” which it always reminds me of. Like you, I never bought the cassette edition because I disliked the format (it wasn’t conducive to careful listening IMO), so I’m pleased to know I can obtain a proper complete copy on CD now. chasinvictoria – Gott Im Himmel!! You too? I’d have thought that you might have acted on the CD uh, a good 38 years in advance of myself! Well I’m not surprised that you see the connection between “His Wife Refused” and “Sharkey’s Day.” His name is Adrian Belew. By the way, “Three Big Songs” contains an extended dance mix of “Big Business” that’s unique to that release. Probably as good a place as any to recommend Angelique Kidjo’s song by song version of Remain in Light that’s just been released. Clearly a dangerous job covering a classic album, but it sounds pretty thrilling in this form to me, have a listen! I know, definitely not easy ro pull off, my wife gave the thumbs down pretty quickly! For me, I got shivers down the spine, not better necessarily but a great alternative view. Would be interested to hear what you think.